Vaikuntha Ekadasi is the most important of all the ekadasis. It is also known as Mukkoti Ekadasi and is important for the followers of Lord Vishnu (Vaishnavites). The festival is dedicated to Lord Vishnu and is celebrated in a grand way in all the Vishnu temples in the South and in the ISKCON temples across the world. The festival is not celebrated much in North India. 'Suddha Ekadasi in the Hindu month of 'Pushya' is celebrated as Mukkoti Ekadasi. It is the 11th day in the 'sukla paksha' i.e the brighter half of the moon, in the auspicious Hindu month of 'Pushya'. It is Dhanur Masam during this time which too is highly important for the Vaishnavites. Know more about Dhanur Masam. It is believed that the 'Vaikuntha Dwaram' i.e the Main Gate of Vaikuntham (the Abode of Lord Vishnu) opens on this auspicious day. 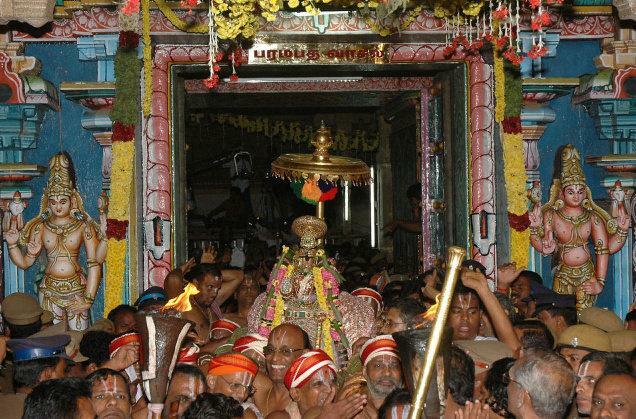 It is because of this reason, devotees are allowed to have a 'Uttara (Vaikuntha) dwara darshanam' of Lord Vishnu in the Vishnu temples in South India. 'Uttara Dwara darshanam' means entering the temple through the North gate, only on this auspicious day. It is believed that those who have the darshan of the Lord from 'Vaikuntha Dwaram' will attain moksha / salvation and reach Vaikuntham - the Abode of Lord Vishnu. However, it is the detachment from materialistic pleasures / world is the way to attain salvation. Temples are heavily crowded with devotees on this day and many religious activities and special poojas take place in the temples on this day. Besides visiting the temples, devotees observe fasting on 'ekadasi' days, few devotees observe 'nirjal upavas' i.e fasting without consuming even water on 'ekadasi' days. The devotees spend the entire day in the name of Lord Vishnu, recite various slokas / stotrams like Vishnu Sahasranama Stotram. It is believed that on this day Lord Krishna preached Srimad Bhagawad Geeta to Pandava Prince Arjuna. Hence, this day is also celebrated as Geeta Jayanti. This year Vaikuntha Ekadasi falls on December 29, 2017 (Friday).